We got a package! What was in that package you ask? The final missing part for Santa Fe Felines lesson one! YAY! All the kits are packed and being picked up by the big brown truck and driver extraordinaire, Sterling, tomorrow. They are on their way! 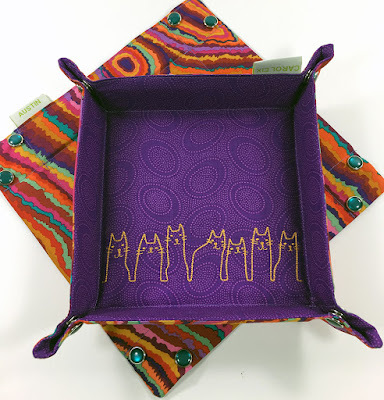 In your box you will find the beautiful canvas painted from original art by Laurel Burch, the first part of the stitchguide, and a big wonderful bag of threads. 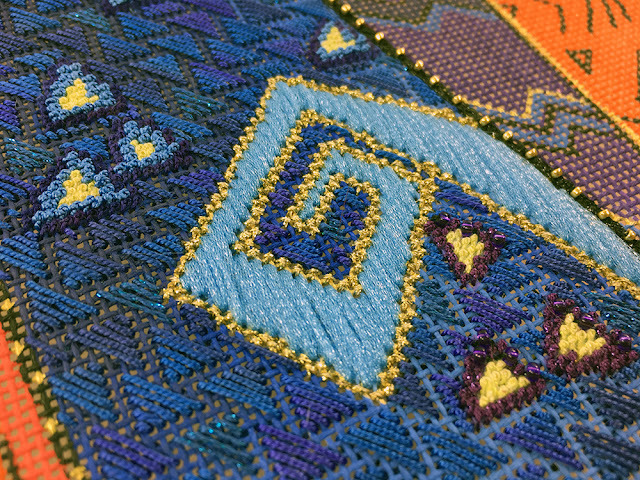 Not only are the threads pretty but they are packaged in an oh so pretty bag designed just for this class. This is my gift to you. In the first lesson you will stitch a cat and the background. 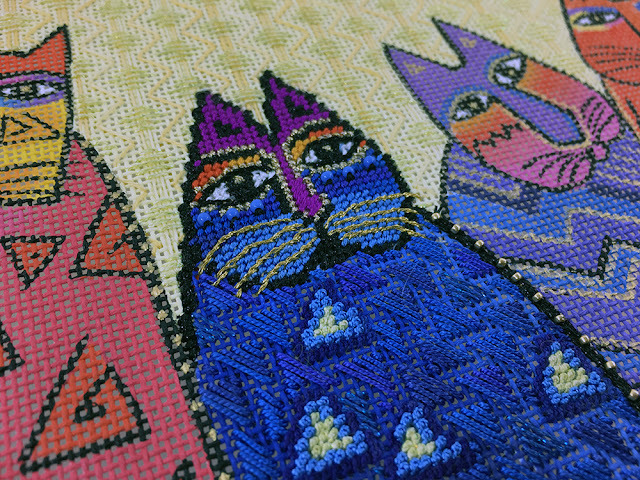 The background stitch is a fun three part stitch using a brand new color of our Color Dreams Floche and Petite Silk Lamé Braid. YUMMY! 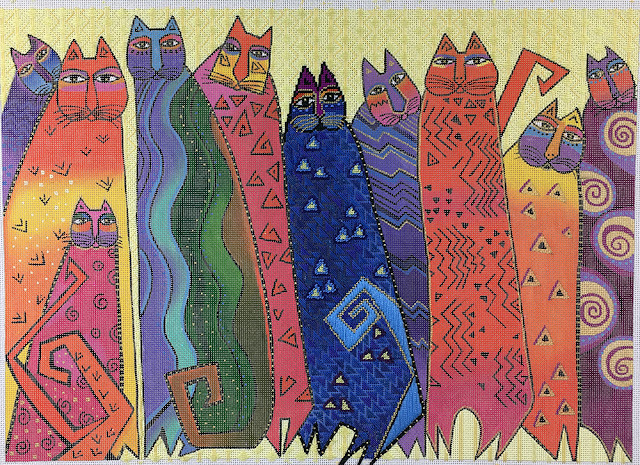 The cats use all types of wonderful threads and stitches. It really is a fun stitch. You get a lot done in the first lesson. This is a Mystery with a Twist so lessons are planned to be approximately 4 months apart. Life has been known to get in the way, but we do our best to fit the lessons in between our other regularly scheduled programming. 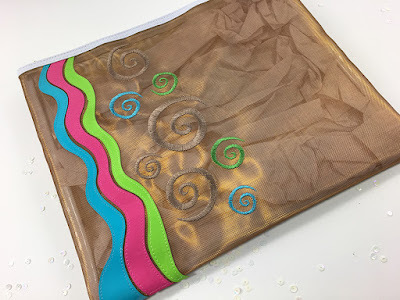 Here’s our pretty thread bag that was trapped in a container for months. Its a sparkly coppery gold metallic. It’s mesh so your threads will breathe while they are stored in here. We have matching limited edition snap trays to keep your threads and scissors close at hand while you are stitching. We have a few extra canvases in stock, so if you would like to join the fun give us a call at 410.296.0405 order online here. We’ll get a kit right out to you. We also have full size canvas keepers the perfect size for this canvas. You know you want to keep it safe while you are working on it. $22 each. Let us know if we should add one to your order. P.S. Next up on my to do list is getting caught up on Why Fit In and then Row of Ladies. They haven’t been forgotten, they are still loved. We are waiting for a shipment for Why Fit In hopefully that will be here soon. 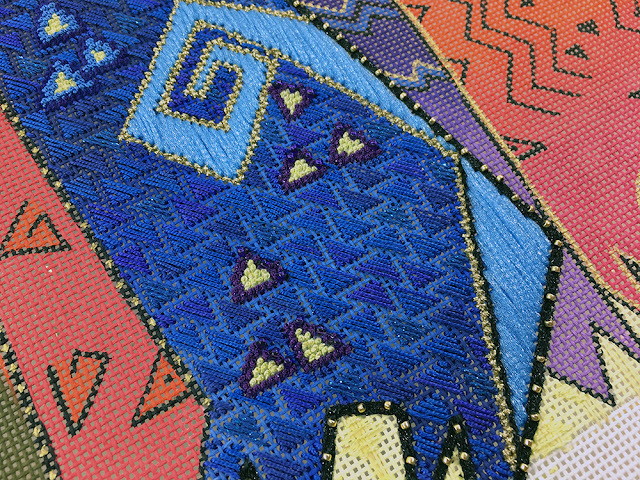 What great stitches that really reflect the original artwork! 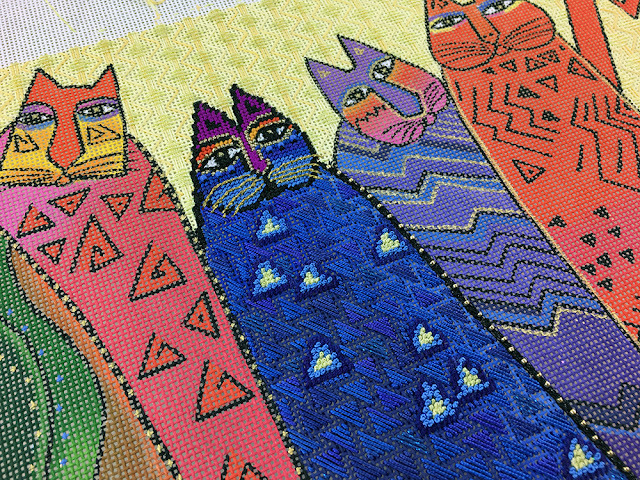 Clever, fun, and easy- that is perfect needlepoint!